Pregnancy and childbirth are definitely an emotional experience in a woman’s life. It is important for a future mother or other family members to check the paternity of an unborn child for peace of mind. The prenatal paternity test is a sensitive subject because of the ethical and moral problems that are linked to it. This test is performed when a woman is pregnant. If, for some reason, the woman does not know who the father of the child is or if the father insists on verifying the paternity of the unborn child, this test helps to identify the child’s biological father. The DNA sample of the unborn child is associated with the DNA sample of the presumed father. DNA pairing can conclusively prove whether the male whose sample is being compared is the father of the child or not. Non-invasive prenatal paternity test: This test is performed after 8th week of the pregnancy. In this, a blood sample from the mother and father is taken and then the test is performed. Amniocentesis: This test is performed between the 14th and 20th week of pregnancy. In this, a small amount of amniotic fluid is taken from the mother’s uterus and is tested. This paternity test requires the consent of the doctor because there is little risk of harm to the baby, miscarriage, cramps, vaginal bleeding and leakage of amniotic fluid. 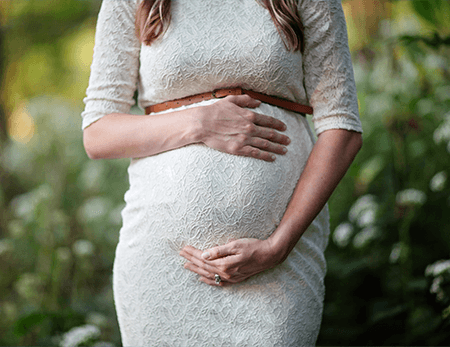 Chorionic villus sampling (CVS): This test is performed during the 10th to 13th week of pregnancy and it involves tests on the chorionic villi obtained from the lining of the uterus. The fetus and chorionic villi have the same genetic makeup and come from the same fertilized egg. This test is done with the consent of a doctor. DNA Forensics Laboratory Pvt. Ltd. provides a 100% secure prenatal paternity DNA test. We deliver the test to determine the paternity from a maternal blood sample in the first trimester during a woman’s pregnancy. Our lab test analyzes and extracts more than 2,688 SNP DNA sequences that we technically call single nucleotide polymorphisms. We provide your results in 10 business days with an accuracy of 99.9%. We are focused on helping hundreds of families and thousands of women with utmost guarantee for prenatal paternity test results. We use latest method for DNA testing and make the prenatal paternity test stress free. Our customer representatives are always there to provide you with the right DNA test without compromising on confidentiality. For more information, call our executives at: +91 8010177771 or +91 9213177771 and get your queries answered at ease.